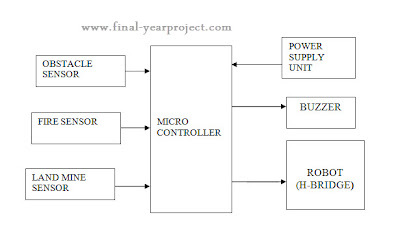 This is a Microcontroller Electronics engineering project on "Super Intelligent Robot". The purpose of the project is to implement a security system with robots for the detection of fire, bombs and obstacles and to provide an alert system when any of these are detected. In this project we are controlling a robot with wire. In this system, a robot is fitted with motors. 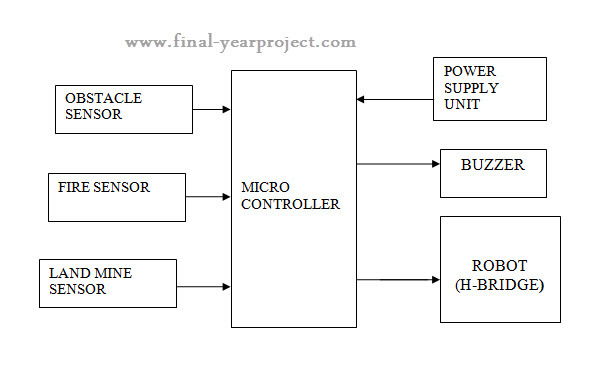 A micro controller is used to control all operations. You can also Subscribe to FINAL YEAR PROJECT'S by Email for more such projects and seminar. The main aim of this project is to design a robotic system with super intelligence which can automatically avoid obstacles in its way, which senses the fire and also detects bombs. This report contains block diagram, circuit diagram, Keil programming and explanation. Use this project report for your reference and study work.